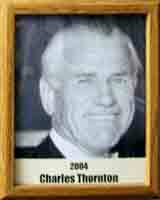 Known as “Charley” to his students and friends, Thornton is a 1930 graduate of Tucson High School where he competed in wrestling, as well as at the Tucson YMCA. He briefly attended the U of A but dropped out due to the Great Depression. Charley had a brief stint as a pro wrestler on the Arizona Pro Wrestling circuit prior to World War II. He came back to Tucson and became a salesman. In 1947 the New Mexico State School for the Blind challenged the Arizona School for the Deaf and Blind to a wrestling meet. With no team and facilities, Charley, along with fellow wrestler Ed Nowell, took it on to create a team. Charley coached the team from 1947-1961. Being physically strong is a necessary attribute in wrestling and his “blind” students had a difficult time achieving that strength and endurance. They tried to run, but could only do so one at a time as they held on to their coach’s shirttail. It was cumbersome and didn’t work. Charley came up with the idea of creating a “track” in which the blind could run by holding on to a small railing. Since they had no facilities, he appealed to local businessmen and service clubs to help him raise the funds to create such a facility. They raised the funds and created the first track for the blind at ASDB and even had money left over to build a wrestling ring. His wrestlers and runners now were able to go on and win state and national titles in their sports. His commitment to the blind including helping his athletes train and partake in “rim-to-rim” hikes at the Grand Canyon starting in 1956.